Citation Information: J Clin Invest. 2004;114(10):1457-1466. https://doi.org/10.1172/JCI21982. Hemoglobin (Hb) A production during red blood cell development is coordinated to minimize the deleterious effects of free α- and β-Hb subunits, which are unstable and cytotoxic. The α-Hb–stabilizing protein (AHSP) is an erythroid protein that specifically binds α-Hb and prevents its precipitation in vitro, which suggests that it may function to limit free α-Hb toxicities in vivo. We investigated this possibility through gene ablation and biochemical studies. AHSP–/– erythrocytes contained hemoglobin precipitates and were short-lived. 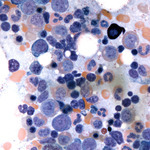 In hematopoietic tissues, erythroid precursors were elevated in number but exhibited increased apoptosis. Consistent with unstable α-Hb, AHSP–/– erythrocytes contained increased ROS and evidence of oxidative damage. Moreover, purified recombinant AHSP inhibited ROS production by α-Hb in solution. Finally, loss of AHSP worsened the phenotype of β-thalassemia, a common inherited anemia characterized by excess free α-Hb. Together, the data support a model in which AHSP binds α-Hb transiently to stabilize its conformation and render it biochemically inert prior to Hb A assembly. This function is essential for normal erythropoiesis and, to a greater extent, in β-thalassemia. Our findings raise the possibility that altered AHSP expression levels could modulate the severity of β-thalassemia in humans. Citation Information: J Clin Invest. 2004;114(1):77-84. https://doi.org/10.1172/JCI21197. Paris-Trousseau syndrome (PTS; also known as Jacobsen syndrome) is characterized by several congenital anomalies including a dysmegakaryopoiesis with two morphologically distinct populations of megakaryocytes (MKs). PTS patients harbor deletions on the long arm of chromosome 11, including the FLI1 gene, which encodes a transcription factor essential for megakaryopoiesis. We show here that lentivirus-mediated overexpression of FLI1 in patient CD34+ cells restores the megakaryopoiesis in vitro, indicating that FLI1 hemizygous deletion contributes to the PTS hematopoietic defects. FISH analysis on pre-mRNA and single-cell RT-PCR revealed that FLI1 expression is mainly monoallelic in CD41+CD42– progenitors, while it is predominantly biallelic in the other stages of megakaryopoiesis. In PTS cells, the hemizygous deletion of FLI1 generates a subpopulation of CD41+CD42– cells completely lacking FLI1 transcription. We propose that the absence of FLI1 expression in these CD41+CD42– cells might prevent their differentiation, which could explain the segregation of the PTS MKs into two subpopulations: one normal and one composed of small immature MKs undergoing a massive lysis, presumably originating from either FLI1+ or FLI1– CD41+CD42– cells, respectively. Thus, we point to the role of transient monoallelic expression of a gene essential for differentiation in the genesis of human haploinsufficiency-associated disease and suggest that such a mechanism may be involved in the pathogenesis of other congenital or acquired genetic diseases. Citation Information: J Clin Invest. 2004;113(12):1784-1791. https://doi.org/10.1172/JCI20673. Small molecule inhibitors, such as imatinib, are effective therapies for tyrosine kinase fusions BCR-ABL–TEL-PDGFβR–mediated human leukemias, but resistance may develop. The unique fusion junctions of these molecules are attractive candidates for molecularly targeted therapeutic intervention using RNA interference (RNAi), which is mediated by small interfering RNA (siRNA). We developed a retroviral system for stable expression of siRNA directed to the unique fusion junction sequence of TEL-PDGFβR in transformed hematopoietic cells. Stable expression of the siRNA resulted in approximately 90% inhibition of TEL-PDGFβR expression and its downstream effectors, including PI3K and mammalian target of rapamycin (mTOR). Expression of TEL-PDGFβR–specific siRNA (TPsiRNA) significantly attenuated the proliferation of TEL-PDGFβR–transformed Ba/F3 cells or disease latency and penetrance in mice induced by intravenous injection of these Ba/F3 cells. Although a 90% reduction in TEL-PDGFβR expression was insufficient to induce cell death, stable siRNA expression sensitized transformed cells to the PDGFβR inhibitor imatinib or to the mTOR inhibitor rapamycin. TPsiRNA also inhibited an imatinib-resistant TEL-PDGFβR mutant, and the inhibition was enhanced by siRNA in combination with PKC412, another PDGFβR inhibitor. Although siRNA delivery in vivo is a challenging problem, stable expression of siRNA, which targets oncogenic fusion genes, may potentiate the effects of conventional therapy for hematologic malignancies. Citation Information: J Clin Invest. 2004;113(11):1596-1606. https://doi.org/10.1172/JCI20741. The leukocyte integrin αMβ2/Mac-1 appears to support the inflammatory response through multiple ligands, but local engagement of fibrin(ogen) may be particularly important for leukocyte function. To define the biological significance of fibrin(ogen)-αMβ2 interaction in vivo, gene-targeted mice were generated in which the αMβ2-binding motif within the fibrinogen γ chain (N390RLSIGE396) was converted to a series of alanine residues. Mice carrying the Fibγ390–396A allele maintained normal levels of fibrinogen, retained normal clotting function, supported platelet aggregation, and never developed spontaneous hemorrhagic events. However, the mutant fibrinogen failed to support αMβ2-mediated adhesion of primary neutrophils, macrophages, and αMβ2-expressing cell lines. The elimination of the αMβ2-binding motif on fibrin(ogen) severely compromised the inflammatory response in vivo as evidenced by a dramatic impediment in leukocyte clearance of Staphylococcus aureus inoculated into the peritoneal cavity. This defect in bacterial clearance was due not to diminished leukocyte trafficking but rather to a failure to fully implement antimicrobial functions. These studies definitively demonstrate that fibrin(ogen) is a physiologically relevant ligand for αMβ2, integrin engagement of fibrin(ogen) is critical to leukocyte function and innate immunity in vivo, and the biological importance of fibrinogen in regulating the inflammatory response can be appreciated outside of any alteration in clotting function. Citation Information: J Clin Invest. 2004;113(6):905-912. https://doi.org/10.1172/JCI19252. The pituitary adenylate cyclase–activating polypeptide (PACAP) is a neuropeptide of the vasoactive intestinal peptide/secretin/glucagon superfamily. Studies in two related patients with a partial trisomy 18p revealed three copies of the PACAP gene and elevated PACAP concentrations in plasma. The patients suffer from severe mental retardation and have a bleeding tendency with mild thrombocytopenia, and their fibroblasts show increased PACAP mRNA levels. The PACAP receptor (vasoactive intestinal peptide/pituitary adenylate cyclase–activating peptide receptor 1 [VPAC1]) in platelets and fibroblasts is coupled to adenylyl cyclase activation. Accordingly, we found increased basal cAMP levels in patients’ platelets and fibroblasts, providing a basis for the reduced platelet aggregation in these patients. Megakaryocyte-specific transgenic overexpression of PACAP in mice correspondingly increased PACAP release from platelets, reduced platelet activation, and prolonged the tail bleeding time. In contrast, the PACAP antagonist PACAP(6-38) or a monoclonal PACAP antibody enhanced the collagen-induced aggregation of normal human platelets, and in PACAP knockout mice, an increased platelet sensitivity toward collagen was found. Thus, we found that PACAP modulates platelet function and demonstrated what we believe to be the first hemostatic defect associated with PACAP overexpression; our study suggests the therapeutic potential to manage arterial thrombosis or bleeding by administration of PACAP mimetics or inhibitors, respectively. Citation Information: J Clin Invest. 2004;113(5):676-685. https://doi.org/10.1172/JCI19540. The mechanisms that lead to reticulin fibrosis of bone marrow (BM) in hairy cell leukemia (HCL) are not fully understood. We therefore investigated the involvement of TGF-β1, a potent fibrogenic cytokine, in this process. Immunoassays revealed that TGF-β1 is present at higher concentrations in BM, serum, and plasma of HCL patients in comparison with healthy donors (P < 0.001). RT-PCR and immunofluorescence studies showed that TGF-β1 is overexpressed at the mRNA and protein levels in peripheral blood, spleen, and BM mononuclear cells and that hairy cells (HCs) are the main source of TGF-β1. Active TGF-β1 correlated significantly with grades of BM fibrosis, infiltration with HCs, and serum procollagen type III aminoterminal propeptide (PIIINP). Ex vivo studies demonstrated that TGF-β1 significantly enhances the production and deposition of reticulin and collagen fibers by BM fibroblasts. In addition, BM plasma of HCL patients increased the synthesis of type I and type III procollagens, the main components of reticulin fibers, at the mRNA and protein levels. This fibrogenic activity of BM plasma was abolished by neutralizing anti–TGF-β1 antibodies. These results show, for the first time to our knowledge, that TGF-β1 is highly expressed in HCs and is directly involved in the pathogenesis of BM reticulin fibrosis in HCL. Citation Information: J Clin Invest. 2004;113(1):38-48. https://doi.org/10.1172/JCI19684.